Vornado 660 Whole Room Air Circulator Fan Review – My Own Air Ventilation Solution for Large Rooms! Let me guess, you have a large room and need a fan to make sure air reaches to every corner of the room. Forget ACs or Ceiling fans, you can do it with a normal alternative. Just make sure you have a little less than $150 on you when you decide to buy it. Ladies and gents, I give you Vornado 660 Whole Room Air Circulator Fan! This is the machine that moves air to every corner of your room without breaking a sweat! In addition to having good design, this little fan has all the materials to last the long haul. In fact, the makers are so sure about the quality that they granted a 5-year guarantee. Don’t worry, I am not getting swayed by the guarantee thing alone. I’ve got my hands on the largest size for this model and I’ll be reviewing it for my readers. I hope you’ll find the answers to lingering questions that you have about this product right here! Let’s get on with the review. If you don’t mind a bit bulky that is. This little wonder comes in three sizes. Choose one according to your room’s size. Vornado 660 is available in gloss and matte finishes. These make the fan look elegant. If one doesn’t like the “Black” color, he/she can switch it up. This little machine is also available in white. However, this is not the end. This little fan can cover a surrounding area of up to 100 feet. Again, the “Design” is to be credited here. You have a Chrome glider bar that allows this model to tilt up to 90 degrees. Also, this sleek model comes with detachable grills. Want to clean the blades? Take the grill off. Easy-to-Handle Controls Make It My Favorite! Well, besides the fact that this fan has a robust design, controls impressed me too. In addition to the 90-degree-tilt thing, this one comes with clearly defined controls that give you the opportunity to select different speeds and program it to spread the air throughout the room. The users have four different speed levels to be exact. There’s this extremely low level of speed called “Turbo.” Then, you have the “Turbo” level. People already know how fast the air is at this level. I loved the 2-pin polarized power cord that sits well with most sockets out there. The cord is made of durable materials too. This thing has a reasonable length. Have You Heard about the Vortex Action? People already know that this fan can push the air to 100 feet distance. The way it does that is through Vortex Action. This means air circulates just like a vortex around it. As you know, you can play around with the speed levels. It makes the fan even better. When operating at different speed levels, you won’t experience the motor heating. In fact, the motor remains cool. As a result, one can get cool air at constant speeds at every level. Before you ask, the fan won’t malfunction while drawing air and there’s a reason for that as well. The most important things for any fan are the blades and the motor. Since you guys know how good the motor is, let’s focus on the blades this time. You have deep pitch blades. These are contoured to an extreme degree. The deep contours have their benefits. One doesn’t need big and sharp blades to cut the air and move it around. 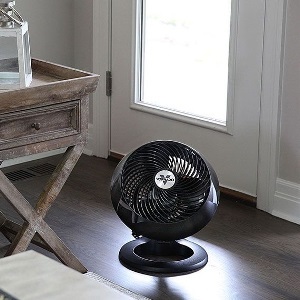 As shown by the Vornado 660 Large Whole Room Air Circulator Fan, one can achieve that with contoured blades and “Inlet Air Accelerator.” The accelerator propels air with speed to your chosen direction. Together, these parts allow the fan to circulate cool air to the entire room. Want a Noiseless Fan? You Got It! 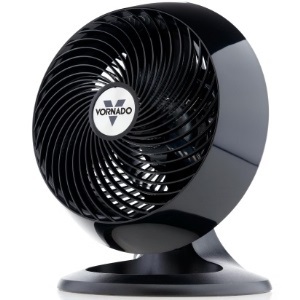 With a simple control panel of four buttons, people might wonder how Vornado 660 will manage to keep it quiet. But it does! To my surprise, at lower levels of speed, you can’t even hear the blades moving! At “Turbo,” it will occasionally make sounds. But it is tolerable. Furthermore, people will find it super easy to clean. One can take grills and parts of the outer cover of the fan with “At Home” tools. Then, use clothes, cleaning solutions, and a drier to get rid of the dirt inside. Assembly is just as painless as taking it apart. The fan will be whole in no time. The design is what will draw people towards the fan. It’s robust, functional, and sleek. Vortex Action deserves a mention for constantly circulating air around the room at different speeds. You have the accelerator and the contoured blades that perfectly regulate airflow. Cleaning is just as easy as operating this fan for newbies and pros alike. I liked how the makers opted to provide 5 years’ warranty along with a sturdy product. 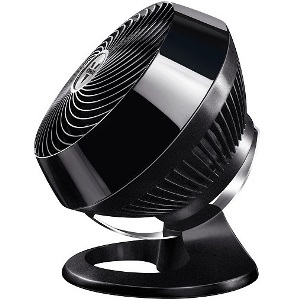 Vornado 660 Fan comes from USA with local materials in the making for longevity and quality. What I Didn’t Like about the Fan? People do have complains with the customer service policy these guys have. As the fan gets to higher speed levels, it gets noisier. People are always on the lookout for the best oscillating fans around. What they don’t realize is that Oscillation is only possible when you stand directly at the path of the fans. But that’s where Vortex Action and Vornado 660 Whole Room Air Circulator is different! As the name suggests, it circulates! A fan costing me just under $120 and with a sturdy design? I’d take it any day of the week. Also, people tend to forget that Vornado comes with a 5-year warranty to back its customers. One can clean it well when he/she needs to. Also, putting it together is no fuss. The fan is for the takers.